We know a good thing when we see it and that’s why we headed to Macleay Island two days in a row. 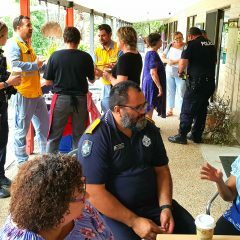 On Thursday March 28, we hosted a Coffee with a Cop at Scorpion Cafe followed by a return to Macleay the very next day to hold a bicycle safety education day at the local school. Both events were without doubt a great success and Sergeant David Purcell should be congratulated for continually proactively bringing these events to the island he looks after. 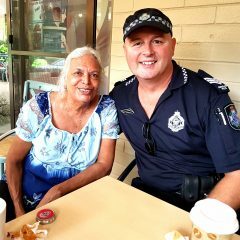 In this Coffee with a Cop, we really wanted to provide cyber safety information and get a clear message out to our community about the difference between reporting to a local station, Triple Zero (000), Policelink and Crime Stoppers. By the amount of information our Volunteers in Policing (ViPs) handed out I think we can safely say we achieved that. We would like to thank our local IGA and State Member for Redlands, Kim Richards for providing funding for the coffees. 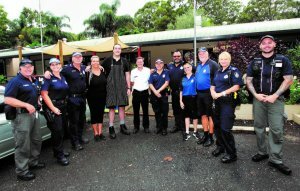 Friday’s visit the following day was a policing partnership deal involving Bayside Police Citizens Youth Club (PCYC) Sergeant Tina Bowen, Bayside Crime Prevention Coordinator (DCPC) Acting Sergeant Brendon Winslow and his team of Volunteers in Policing (ViPs), Police Liaison Officer (PLO) and of course our local Macleay Island Police. 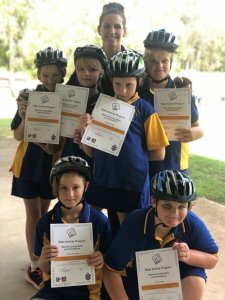 Macleay Island State School pupils of all ages were treated to a special day of bike riding, bike education and road safety rules and to top it off, all 140 pupils received a free bike helmet courtesy of Bayside PCYC. 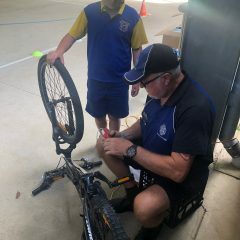 Sergeant Tina Bowen sourced the helmets through PCYC funding and with the help of the bayside DCPC team, local police were able to coordinate a whole day of fun with a touch of learning and helmet fitting to go with it. 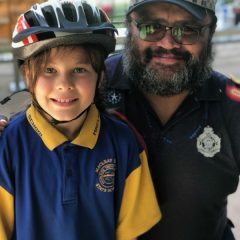 “We don’t always get to help kids like this and when we get the chance, it really does make it all worthwhile,” Sergeant Bown said.